Children of the World. 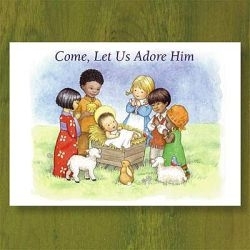 This beautiful Christian Christmas Card is from Abbey Press and includes a meaningful message with Scripture. The artwork features little children worshipping Jesus in the manger. Front Christmas Verse: Come, Let Us Adore Him. Inside Christmas Verse: May your Christmas be enriched with a childlike awareness of God's most precious Gift. Bible Verse: For God so loved the world that he gave his only Son, so that everyone who believes in him may not perish but may have eternal life. John 3:16. Size: 4.5 x 6.25 inches. 25 cards with 26 envelopes.